Gunta Stölzl, an innovative and influential textile designer, began as a student at the Bauhaus in 1919 and was named the only female Bauhaus Master in 1927—by which time she had made the Weaving Workshop the most profitable workshop at the Bauhaus. The Bauhaus period was, for all of us, like a chamber of unalienable pleasures. Born in Munich in 1897, Stölzl studied painting, ceramics and art history at the Kunstgewerbeschule (School of Arts & Crafts) in Munich from 1913-16. 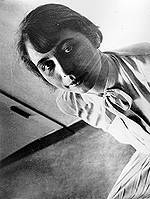 After serving as a Red Cross nurse from 1917-18 during World War I, Stölzl became aware of the Bauhaus, which was founded by Walter Gropius in Weimar in 1919. 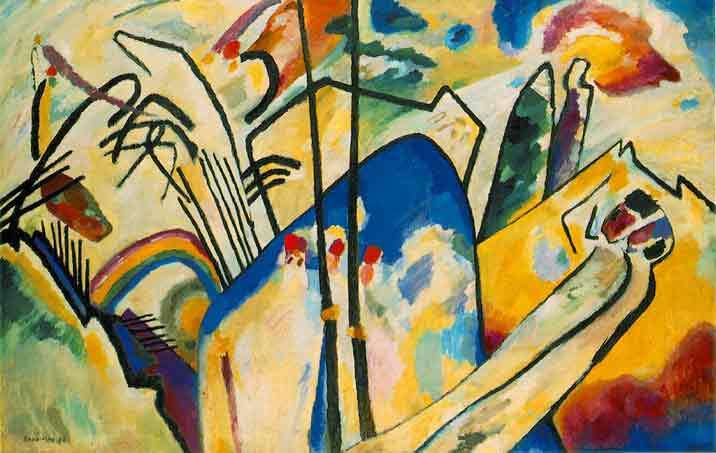 Like many of the female students, Stölzl was an accomplished visual artist attracted to the Bauhaus by the presence of painters Wassily Kandinsky, Paul Klee, Johannes Itten, Josef Albers, Lyonel Feininger and others. 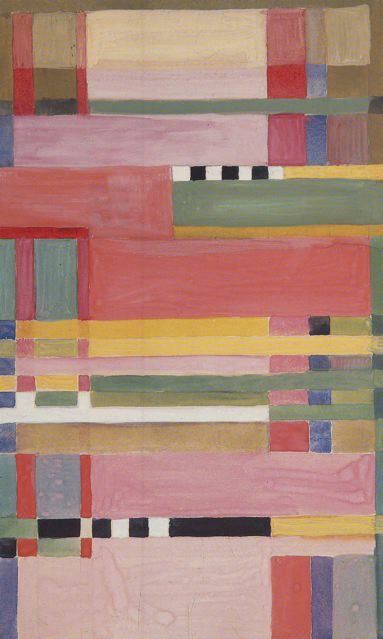 In the spring of 1920, Stölzl was accepted on a trial basis to the Bauhaus and enrolled in Johannes Itten’s Vorkurs (preliminary course). 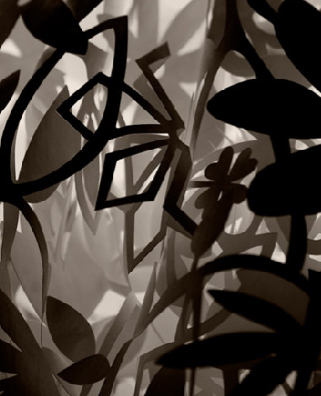 This approach also contributed to a lot of collaboration and cross-pollination of visual ideas. Gropius had founded the Bauhaus on the principle of Gesamtkunstwerk (total work of art), where design, visual aesthetics and mastery of technique would come together. The admission policy espoused gender equality, but the reality was very different. Gropius was taken aback by how many women applied to the Bauhaus and quickly established a “Women’s Department” to channel the female students into the Weaving, Bookbinding and Pottery Workshops—and, with few exceptions, such as Florence Henri, this was what transpired. As it turned out, Gerhard Marcks, the head of the Pottery Workshop, did not want women in his department and the Bookbinding Workshop shut down in 1922. The result was that the Weaving Workshop soon remained the sole option for many female Bauhaus students, who only had access to painting classes via the Weaving Workshop. When Gunta Stölzl joined the Weaving Workshop, it was languishing under the leadership of Georg Muche, the master of the Weaving Workshop from 1921-27, and Helene Börner—neither of whom had the skills to help the students advance their technique. Börner, who provided all the looms and equipment for the Weaving Workshop, had been trained as a Handarbeitslehrerin (home economics teacher) which garnered her little respect among the students. Stölzl soon took over the technical direction of the workshop. She was a person of tremendous enthusiasm and energy and she quickly understood the equipment and grasped the possibilities of weaving. She had an instinctive feel for the process, was passionate about experimenting with new materials and constantly explored new ideas in color and design and their applications for industrial design. 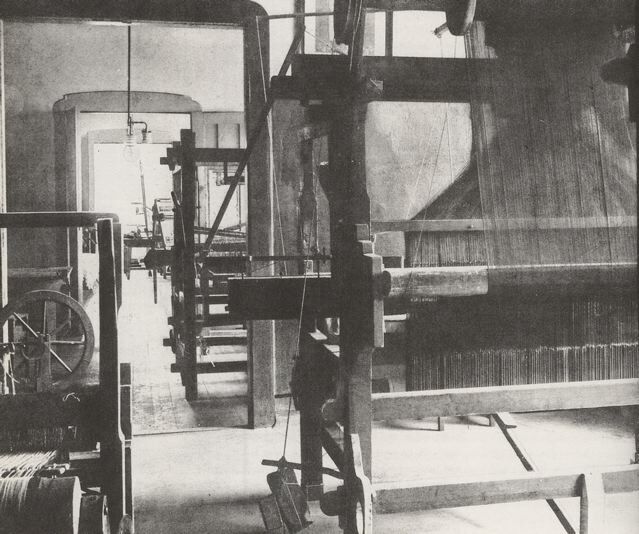 In 1922 Stölzl studied dyeing techniques in Krefeld with fellow Bauhaus weaver Benita Otte and on their return established a dye facility at the Bauhaus. 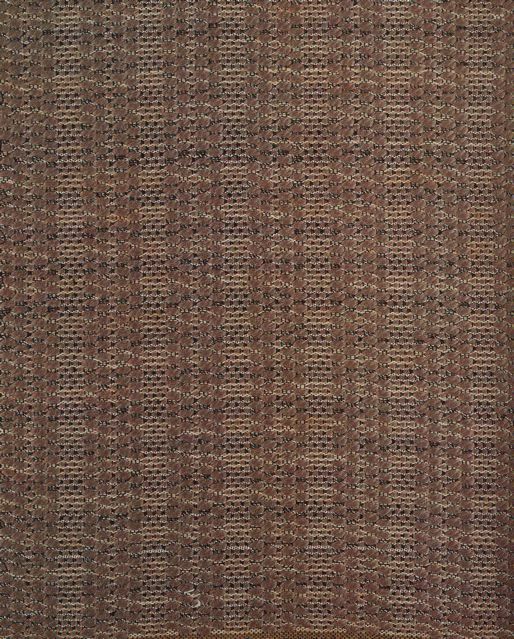 One of Stölzl’s students, Anni Albers, often said that Stölzl was an excellent teacher, “having almost an animal feeling for textiles.” Stölzl was appointed craft master of the Weaving Workshop in Dessau in 1925. 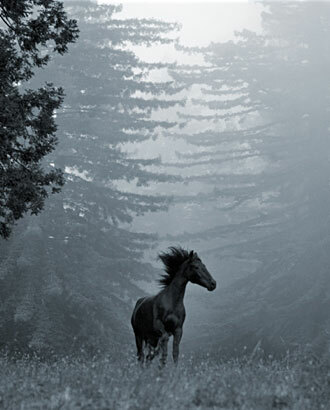 I believe that the most important of all was life itself. It was brimful with impressions, experiences, encounters and friendships which have lasted over decades. 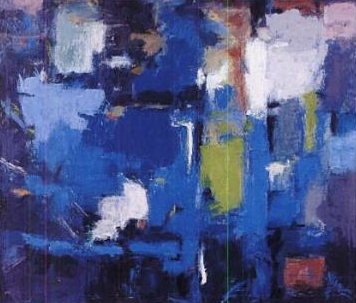 The more abstract is form, the more clear and direct its appeal…The more an artist uses these abstracted forms, the deeper and more confidently will he advance into the kingdom of the abstract. Exploring these principles, Stölzl guided the Weaving Workshop from personal, pictorial and decorative tapestry weaving to the production of innovative, abstract and geometric textiles for domestic and industrial use. 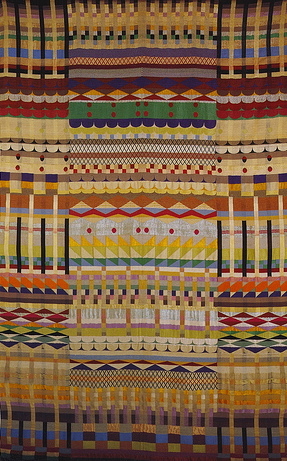 In accordance with Bauhaus philosophy, textiles as art or a means of personal expression was discouraged, utility and simplicity were valued. Stölzl’s creative energies were devoted to developing new weave structures, the innovative use of synthetic fibers and exploring new dyeing techniques. Gradually a change took place. We began to sense how pretentious these independent, unique pieces were: tablecloths, curtains, wall coverings. The richness of colour and form became too licentious for us; it did not adapt itself, it did not subordinate itself to living. 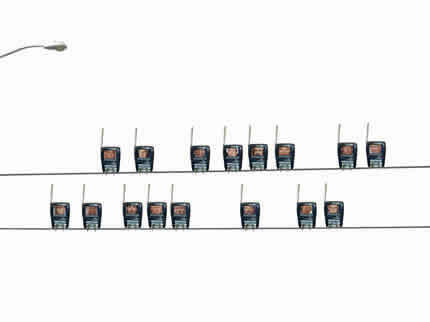 We tried to become more simple, to discipline our means, to use these in a more straightforward and functional way. Thus we came to yard goods which could directly serve the room, the living problem. The watchword of the new epoch was models for industry. 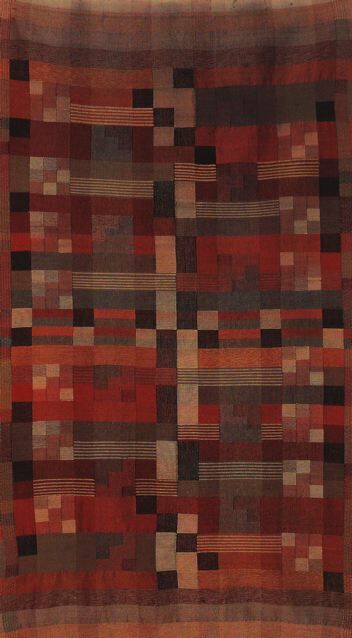 The textile designs of Gunta Stölzl and Anni Albers are creative experiments in material, structure and color. 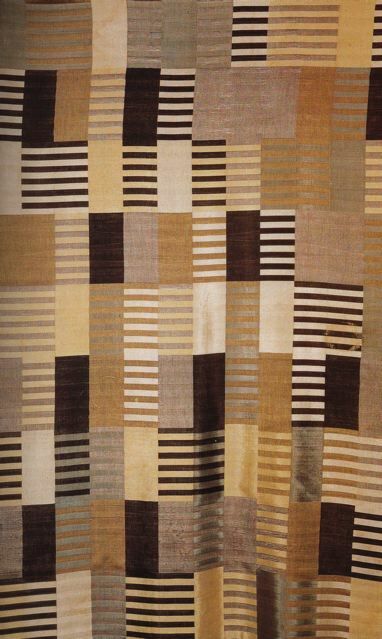 Rejecting a nineteenth-century tradition of cloth-making that emphasized pictorial imagery, Stölzl and Albers altered the course of twentieth-century weaving by introducing new fibers and finishes and by revealing the fundamental woven structure, or the warp and weft, of the cloth. A book about Stölzl’s life and work, with text and forward by her daughter, Monika Stadler, Gunta Stölzl: Bauhaus Master, has recently been published by The Museum of Modern Art. 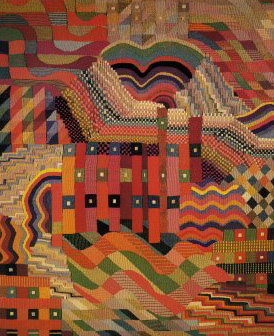 Also recommended reading: Women’s Work: Textile Art from the Bauhaus by Sigrid Wortmann Weltge. 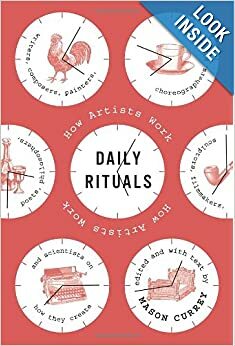 Stölzl’s work can be seen in the upcoming exhibit at the Museum of Modern Art, Bauhaus 1919-1933: Workshops for Modernity, November 8, 2009-January 25, 2010. An accompanying monograph, Bauhaus Women: Art, Handicraft, Design by Ulrike Miller, will be available in November 2009. Editor’s Note: Over the past several weeks our contributors have been on hiatus, in order to participate in SF Open Studios event. With this piece Venetian Red resumes its regular posting schedule. acrylic on canvas, 72 1/4 x 135 1/2″. In 1924, Alma Thomas (1891-1978) became the first woman to graduate from Howard University’s newly-created fine arts department. Quite possibly, she was the first African-American to hold this kind of degree. She went on to become the first women to receive a Masters’ degree (teaching) from Columbia University. 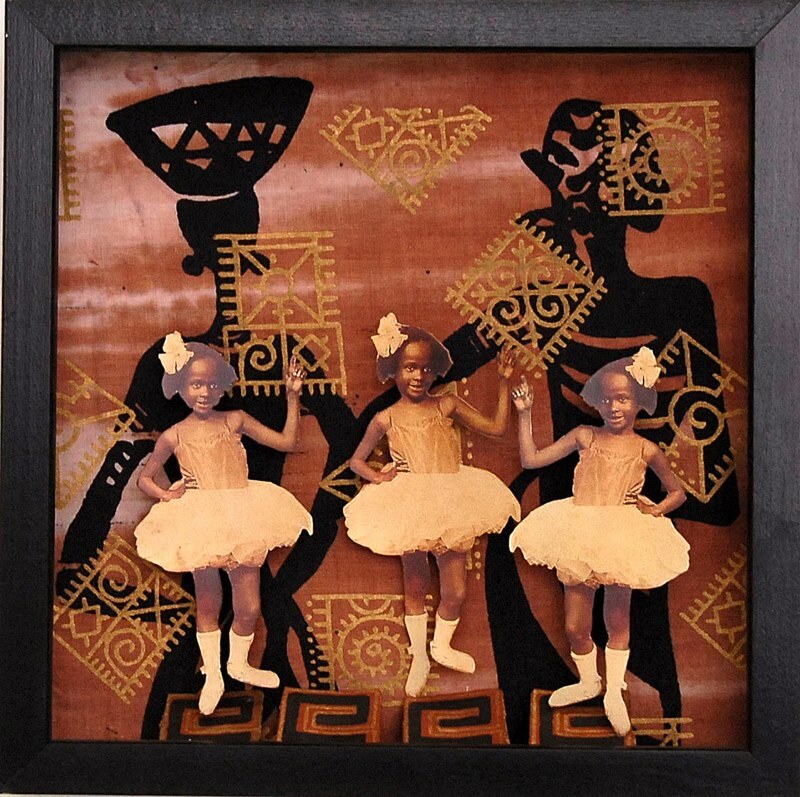 For 35 years, Thomas dedicated herself to teaching art to high school students. 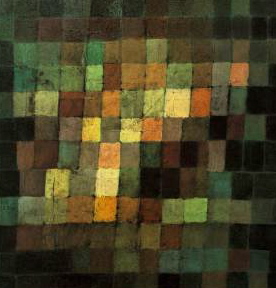 She retired in 1960, in order to focus on her own work. 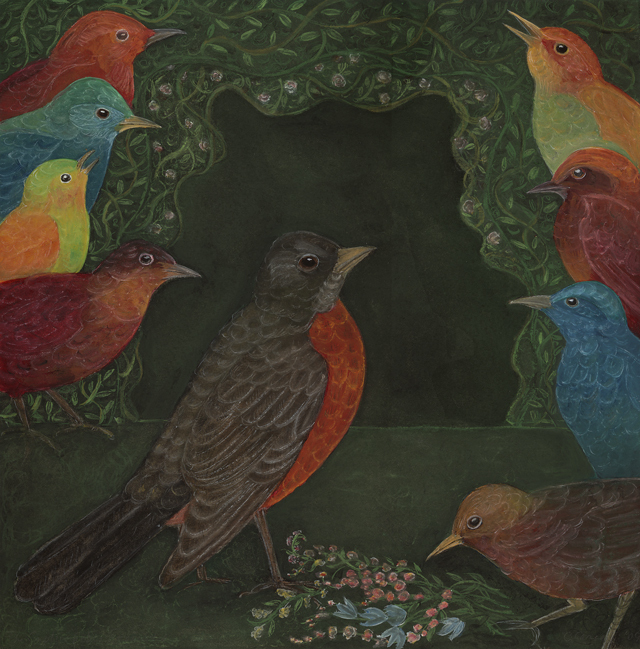 In her 70s, plagued by arthritis and degenerating eyesight, she threw herself into her work. In 1972, at age 80, she became the first African-American woman to have a solo show mounted by the Whitney Museum of American Art. Two weeks ago, Alma Thomas made news yet again. oil on canvas, 34 x 40″. Although the list of artworks the Obamas have requisitioned for the White House collection was released months ago, it wasn’t until a recent New York Times’ article—“White House Art”—that members of the conservative blogosphere found another excuse to blast the Obama administration. 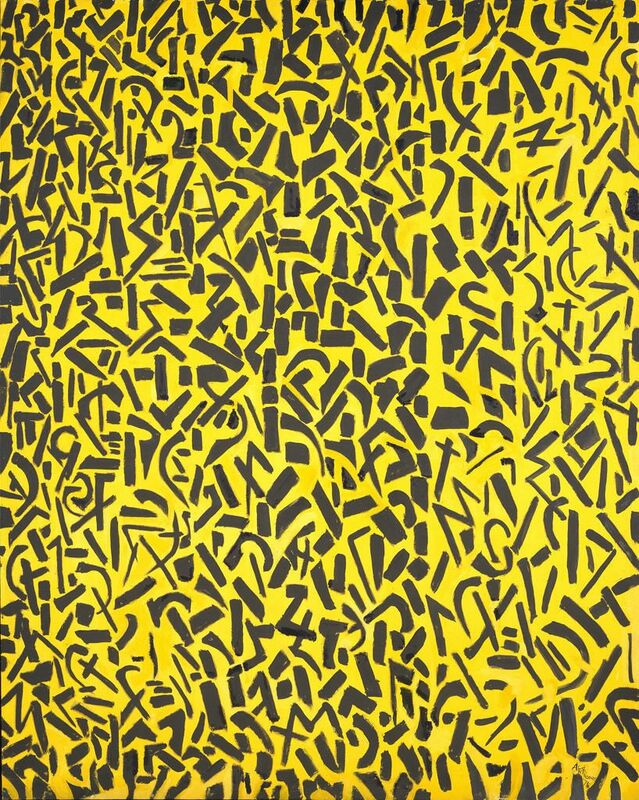 Indignant, they locked their rifle scopes on one painting in particular, Alma Thomas’ Watusi (Hard Edge). Free Republic and Michelle Malkin posted particularly exemplary pieces, decrying the work as an “almost exact replication” of Henri Matisse’s (1869-1954) The Snail. 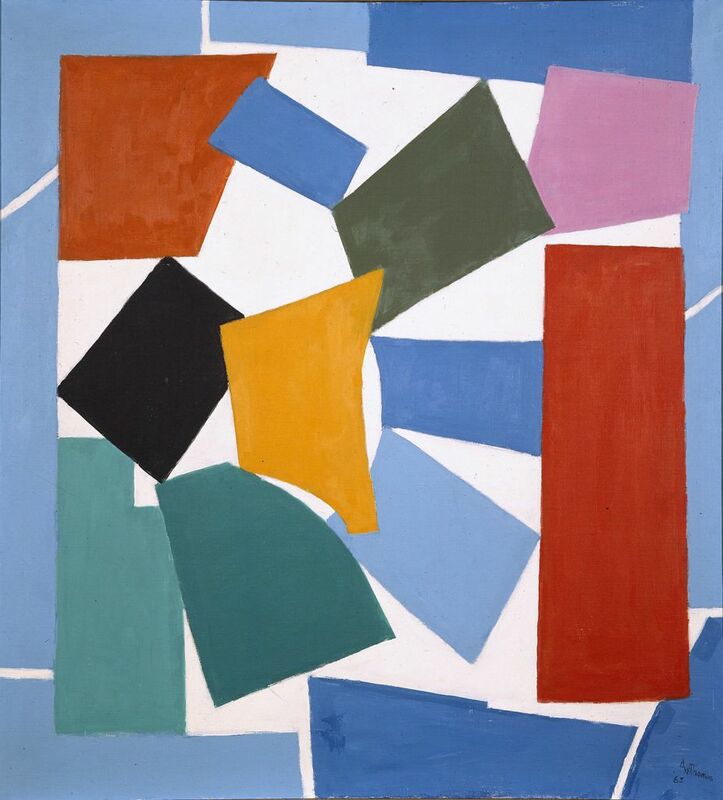 All Thomas had done, they argued, was to rotate Matisse’s canvas clockwise 90° and change some colors. “An embarrassment for the ‘sophisticates’ who failed to spot a copy hiding in plain sight,” one blogger hissed. gouache on paper, cut and pasted on paper mounted on canvas, approximately 113″ square. acrylic on canvas, 47 5/8 x 44 1/4″. 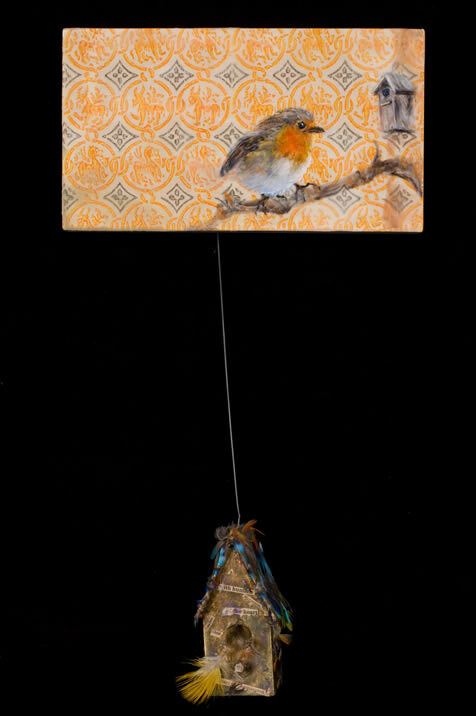 torn-and-pasted paper and colored paper on colored paper, 19 1/8 x 13 5/8″. 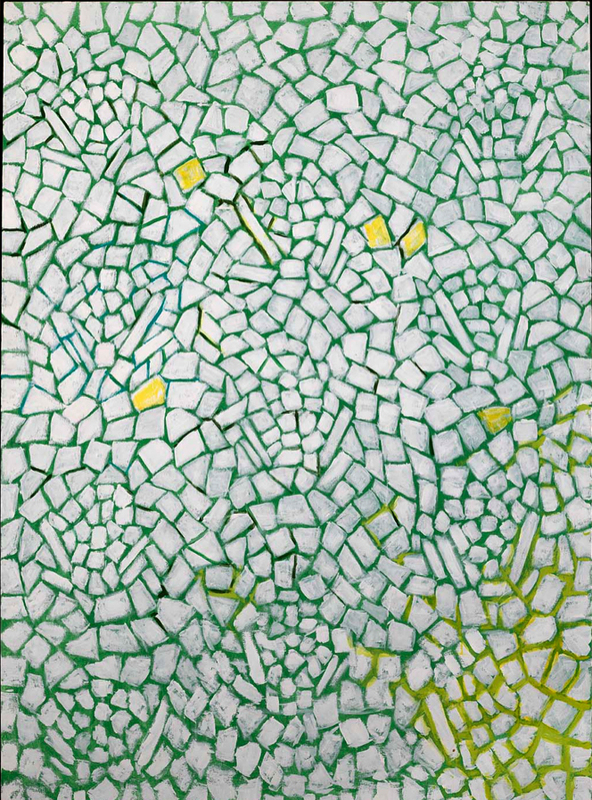 Did Alma Thomas copy Matisse? 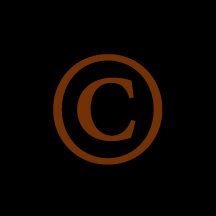 When it comes to intellectual property, despite legal guidelines, copying is often harder to prove than it would seem. acrylic on canvas, 69 x 50″. 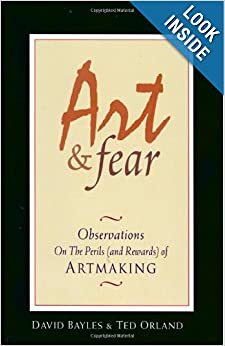 On the one hand, as any trained artist knows, examining the world through the eyes of others is a necessary step on the road to developing a “mature” personal style. Indeed, all of human progress has been built on the shoulders of previous giants. Matisse’s cutouts could not have existed without the work of the collagists who preceded him—Jean Arp, Kurt Schwitters, Hannah Höch—who in turn owed debts to earlier Cubists, Picasso and Braque. And on it goes. watercolor and gouache on cut and pasted papers, 75 11/16 x 35 7/8″. On the other hand, illegitimate copying is real. Both Richard Prince (See VR’s “Prince of Pilfer”) and Jeff Koons have been sued by photographers for incorporating copyrighted work into their own. Koons lost the Rogers v. Koons case, but won a more recent suit under the “fair use” doctrine. Readers will remember that earlier this year Damien Hirst threatened to sue a 16-year-old over his use of an image of Hirst’s diamond-incrusted skull, in the process demanding royalties. Alma Thomas at work in her studio, 1970s? In the imaginary case of Matisse v. Thomas, interpretations of the “substantially similar” clause suggest many ambiguities that would present a challenge to definitively proving copyright infringement. (Imagined cries of “I know copying when I see it!” from Thomas bashers aside.) Thomas always credited Matisse for the inspiration that produced Watusi. It is obvious that the work launched her on a journey of artistic discovery that produced her unique and forward-looking (if not radical) mosaic style. To assert that Thomas was “simply copying” Matisse would be to deny the rich and varied underpinnings of her work. Thomas was deeply impressed by the colors and patterns of the natural world around her. “Light reveals to us the spirit and living soul of the world through colors,” she once said. oil on linen, approximately 21 x 25″. 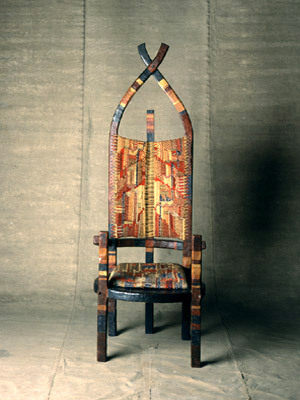 At her best, Thomas adeptly fused her own interpretation of the modernist approaches to color with the craft traditions (textile-based in Thomas’ case) of black America to arrive at a style that, while abstract, never quite looses its connection with natural form. In addition to Matisse, Thomas identified with the work of Cézanne, as well as her teachers Jacob Kainen, Robert Gates, Joe Summerford, and Lois Mailou Jones. acrylic on canvas, 68 1/4 X 54 1/4″. acrylic on canvas, 72 1/2 x 52 3/8″. Over the four weekends in October we’re highlighting San Francisco Open Studios, the largest program of its kind in the country. Artists invite viewers into their studios to see the work outside of the gallery system. SF Open Studios takes place during successive weekends in October, different neighborhoods on different weekends. Over the four weekends in October we’re highlighting San Francisco Open Studios, the largest program of its kind in the country. Artists invite viewers into their studios to see the work outside of the gallery system. Deborah Howard-Page— 547 Arkansas Street (at 20th). Mark Faigenbaum—611 Texas Street (at 22nd). David Patchen—1750 Armstrong Avenue at 3rd Street. gouache (?) 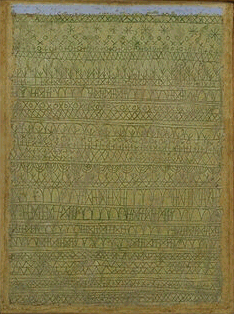 heightened with gold and silver on paper , 9 5/8 x 7½ in. Born in Mumbai in 1936, Ismail Merchant was one half of the longest running partnership (both business and romantic) in independent film history. Established in 1961, the collaboration that was Merchant Ivory lasted over 40 years and produced scores of films. 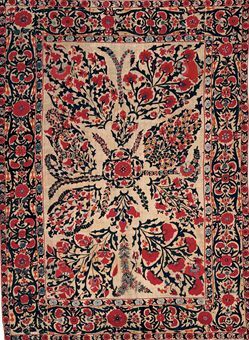 Suzani, Shakrhrizabz Region (Uzbekistan), 68 x 96 in., mid-19th c.
The pair was best known for their rich and faithful film adaptations of literary works both past and contemporary—James’ The Europeans and The Bostonians; E.M. Forster’s Howard’s End; Diane Johnston’s Le Divorce; Ruth Prawer Jhabvala’s (their writing partner) Heat and Dust; and of course Kazuo Ishiguro’s Remains of the Day with its all-star cast. In this world, Ismail Merchant’s particular talent was his ability to produce lush-looking period pieces on distincly non-Hollywood budgets. 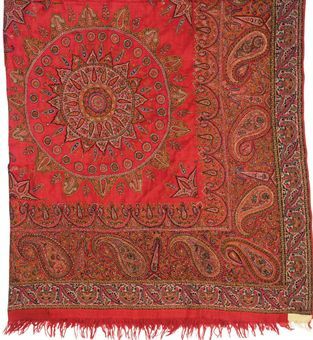 Amli Shawl of Red Pashmina, Kashmir, mid-19th century. Merchant’s other passion was expressed in obsessive collecting. His film production work him unique access to galleries and dealers around the world and he took full advantage of the privilege, amassing a large collection of Indian textiles (some Central Asian) and miniatures, as well as European furniture, Indian silver, and European paintings of India. 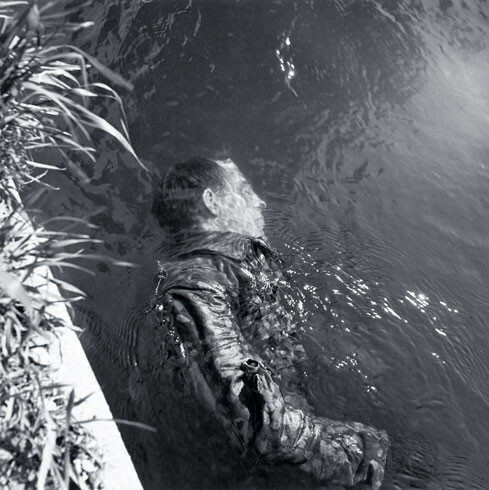 His two worlds were seamless—often pieces from his collection showed up on the sets of his movies. 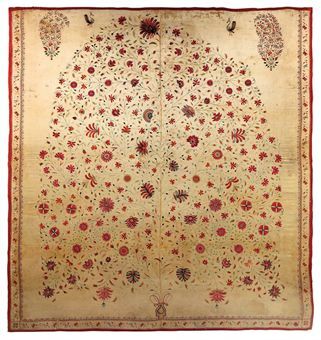 Ivory Silk Tent Panel (Kanat), India (probably Gujurat), late 18th c.
James Ivory held onto the collection after Merchant’s death in 2005, as some of the pieces had sentimental value. But many did not, and he finally commissioned Christie’s to auction off 300 pieces. The results of the auction, held this past Wednesday, were exceptional, fetching over £6 million. 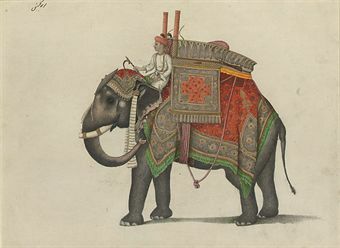 A Fraser Album Artist, Elephant and Driver, 1815-1819, pencil & watercolor. 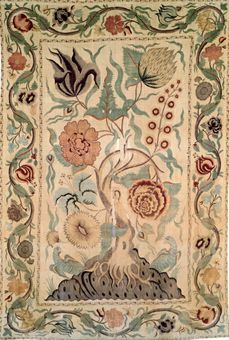 This is the second installment in a series of posts, in which Venetian Red explores aspects of artist-designed textiles. 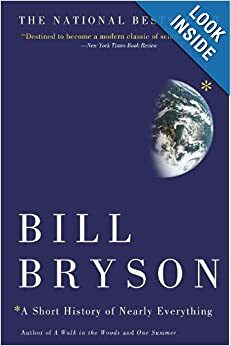 For all posts in the series, click here. 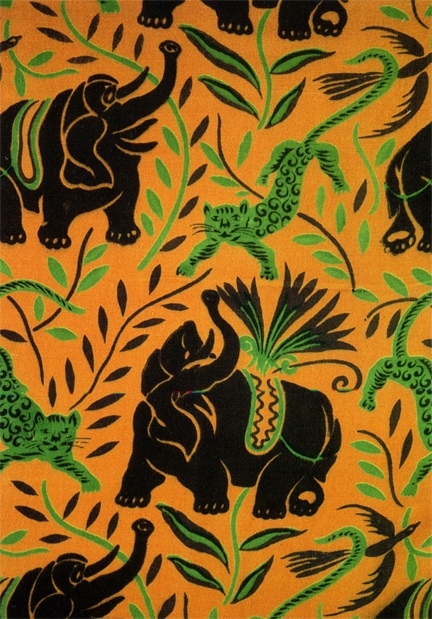 Raoul Dufy, Jungle, printed cotton, 1922. 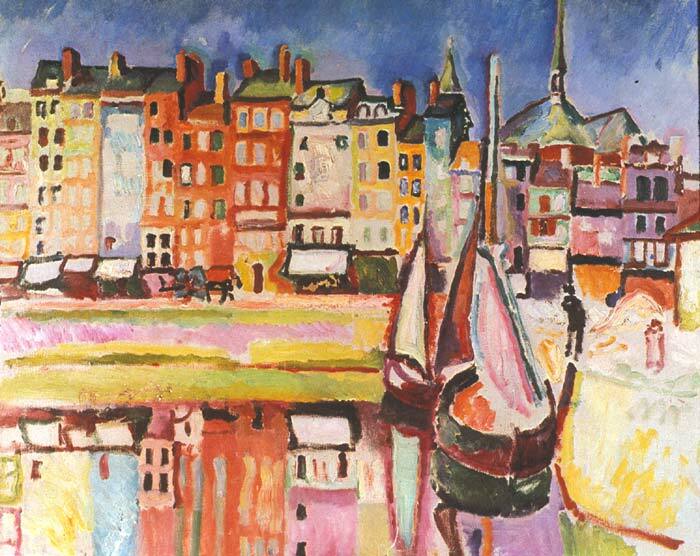 A versatile painter, Raoul Dufy (1877-1953) was equally at home in the disciplines of fine and applied arts. 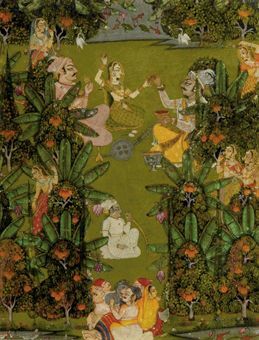 In addition to several thousand paintings and drawings, he left behind illustrations for about 50 literary works, more than four dozen tapestries, 200 ceramic pieces, and nearly 5,000 fabric designs. As an ardent disciple of Matisse, Duffy’s witty and joyous paintings of southern France, with their vibrant colors, calligraphic lines, and sparse modeling, are a testament to the zeal with which the painter remade himself from an Impressionist into a Fauve. 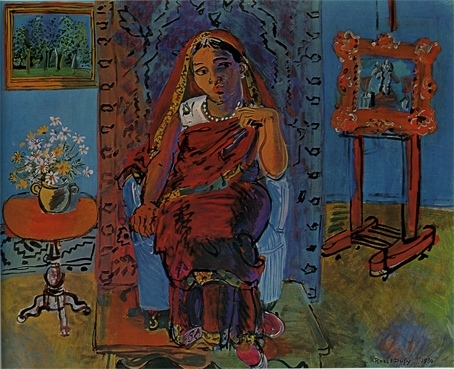 Dufy certainly shared his mentor’s pre-occupation with the decorative. Ornamental elements show up in his earlier paintings. 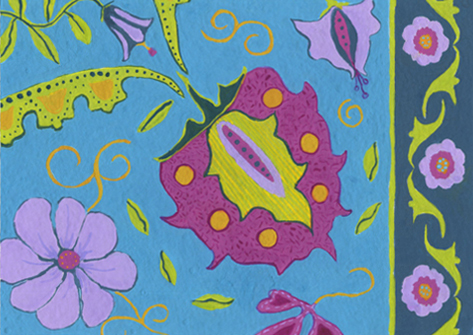 But Dufy’s textile designs are where he manipulates the decorative into sensuous and ecstatic works. In fact, Dufy’s work in textile design, first with fashion designer Paul Poiret and later with the Lyons-based silk manufacturer Bianchini-Ferier, directly informed his fine art style. 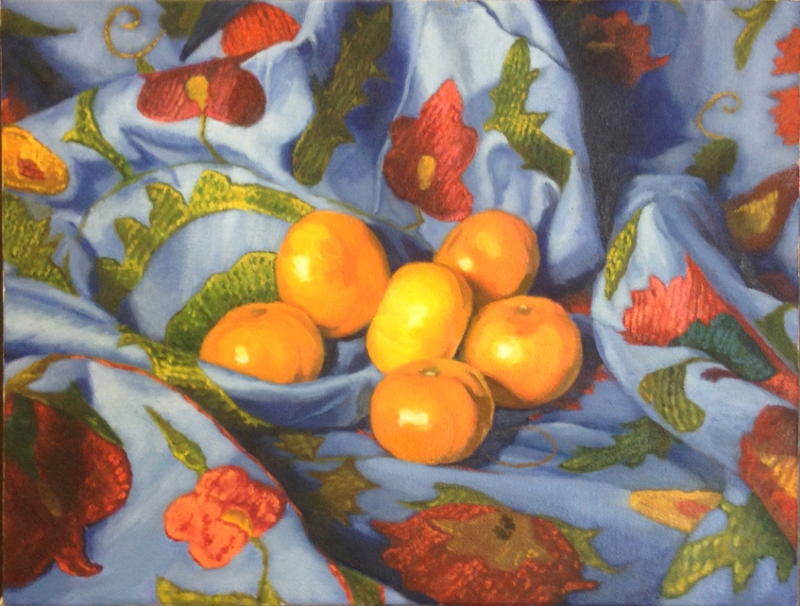 The flat decorative pattern of colors he employed in textile designs made their way back into his paintings; by the late 20s all of his paintings fully embrace ornament. The collaborations with Poiret began in 1910. Though he had participated five years earlier in the prestigious exhibitions of the time (Les Salons d’Automne and Indépendents), Dufy found himself facing sobering financial circumstances. It must have seemed like a godsend, when Poiret, on the basis of the artist’s experiments in woodcuts, commissioned him to design fabrics. (Courtesy FDIM Museum, Los Angeles). Then at the peak of his influence, Poiret was known simply as Le Magnifique, a reference to Sultan Süleyman the Magnificent, who had led Ottoman Empire to its most expansive and powerful. Working with fabric directly on the body, Poiret pioneered a radical approach to dressmaking that relied on the skills of draping rather than tailoring and pattern making. Looking to antique and regional dress, in particular “oriental” styles, Poiret advocated clothing cut along straight lines and constructed of rectangles. More practically, Poiret’s trailblazing notions about fashion liberated women from the Edwardian corset. 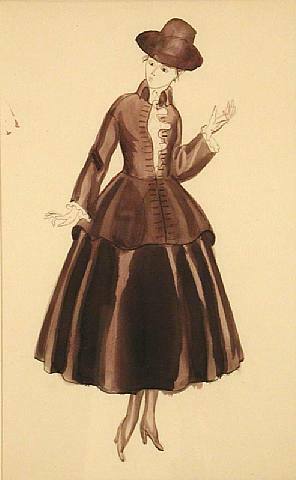 Raoul Dufy, Design for Paul Poiret, ca. 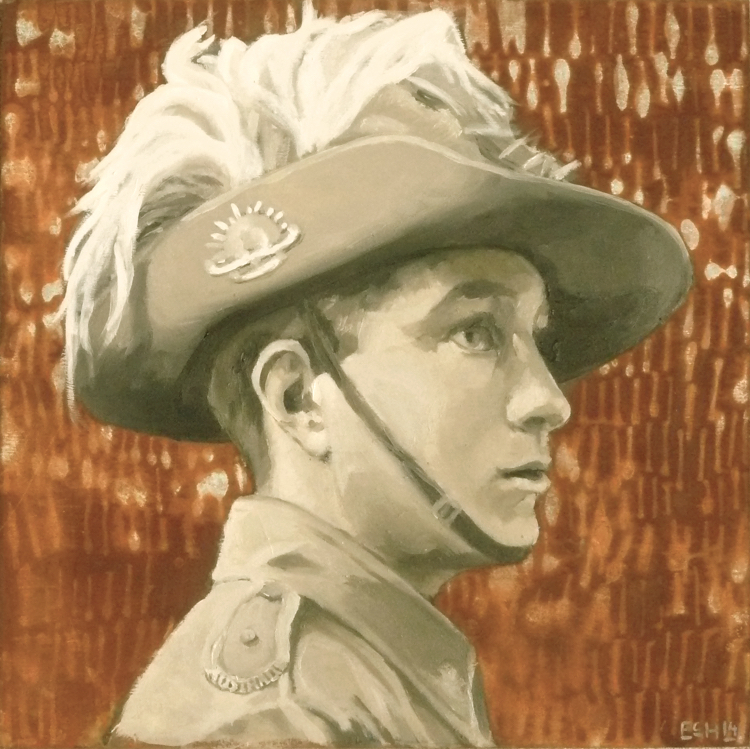 1917 (Miriam Shiell Fine Art). 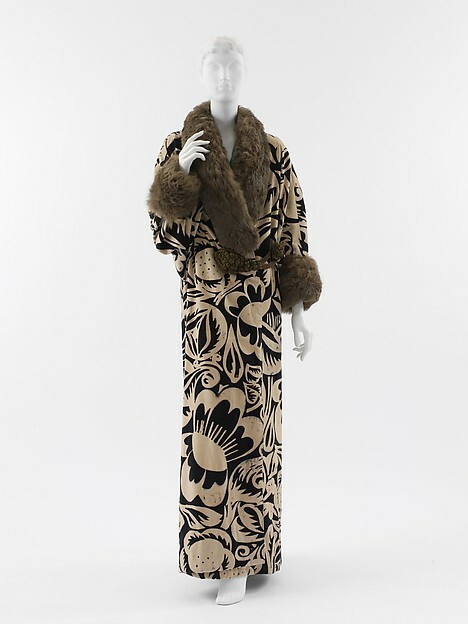 Poiret saw no distinction between the fine and applied arts; he saw art and fashion as indivisible. 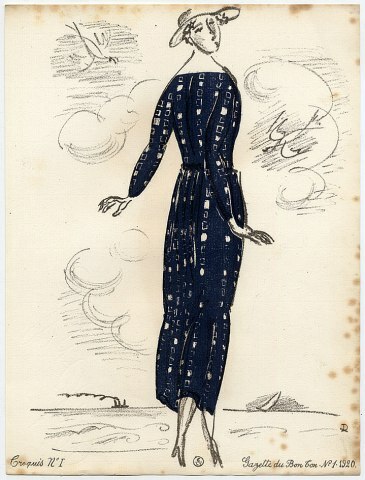 Poiret promoted his fashions as unique and original works of art in and of themselves. The collaboration with Dufy produced such signature creations as “La Perse” coat, “La Rose d’Iribe” day dress, and the “Bois de Boulogne” dinner dress (which is made from a fabric that Dufy designed in conjunction with Bianchini-Férier). 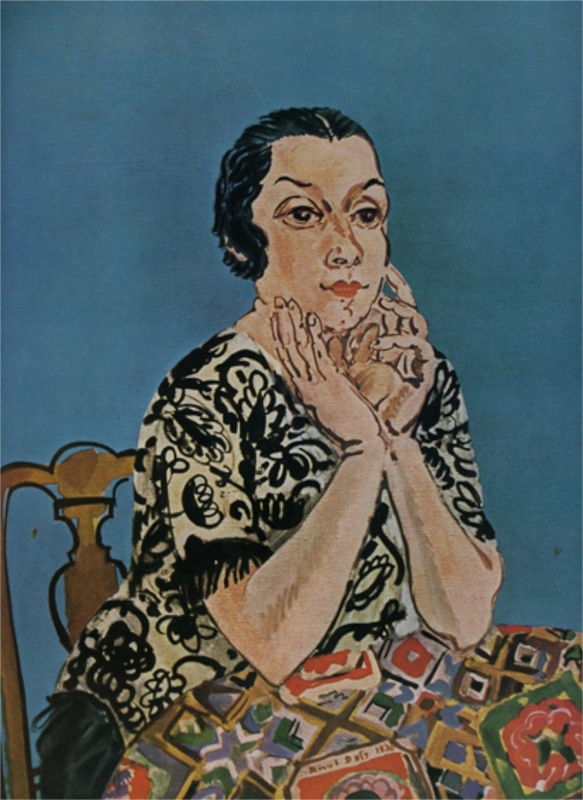 They demonstrate how Dufy’s flat, graphic patterns were ideally suited to Poiret’s designs. It was a short-lived but fruitful collaboration. Failing to imitate Dufy’s bold wood-blocked patterns, in 1912 Charles Bianchini made Dufy an offer too good to refuse, and Dufy left his partnership with Poiret to sign on to an exclusive contract with the Lyonaise firm. This incredibly productive relationship lasted until the late 1920s and produced thousands of designs. 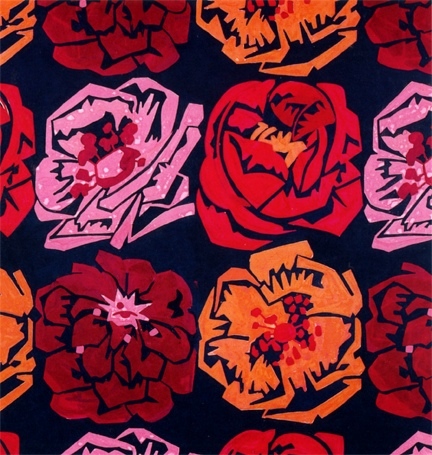 Attributed to Raoul Dufy, Roses, printed cotton, 1929. Though many of the artist’s designs were monochromatic, mimicking style of thick lined woodcuts, Dufy also utilized the sumptuous palette of the Fauves to great success. He returned to certain themes again and again—florals and exotic animals (the leopard and elephant for example) were particular favorites. Dufy was a master at designing geometric patterns using blocks of opposing colors—the design created equally by the object and by the negative space enclosing it. 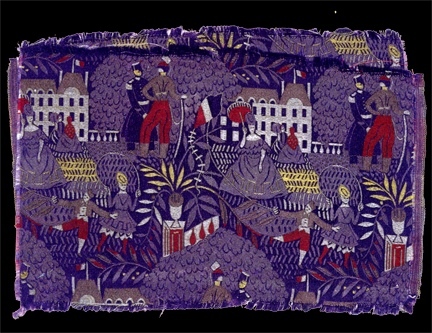 Raoul Dufy, Les Tuilleries, woven textile design, 1920-21. In the process of working both sides of the art street, so to speak, Raoul Dufy helped to change the face of fashion and fabric design. He was nearly single-handedly responsible for the formulation of practically all modern fabric design between 1909 and 1930, and his style radically influenced the popular arts and the commercial design of the Western world. Even today, Dufy’s vision informs the color, design, texture, and imagery of a wide range of products in our contemporary world.